Mr. Haden is a partner in Hunter, Smith & Davis’ Litigation and Employment Law practice groups. He is a member of the American, Tennessee and Kingsport Bar Associations. 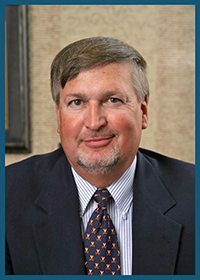 Mr. Haden is a former member of the Tennessee Supreme Court’s Commission on Continuing Legal Education and Specialization. He has spoken before many organizations on tort law issues, workers’ compensation issues, and civil trial practice and techniques. Mr. Haden is on the board of directors for the Colonial Heights Rebels Baseball, Inc. and served as the head coach of the Rebels 12U Baseball Team for many years. Mr. Haden formerly served as an instructor of adult education/GED courses in the Greater Kingsport area. He is a member of the Colonial Heights Christian Church. Born in Charlottesville, Virginia, Mr. Haden resides in Kingsport, Tennessee.